A brilliant purple amethyst stone sits in the center of this bezel set amethyst women's cross pendant in 14K white gold from Apples of Gold Jewelry. The vivid purple amethyst stone is a genuine stone that measures 2mm in size and is AA rated. The cross pendant measures 1.20 inches tall, with a width of 0.65 inches, and features a plain, yet stunningly polished finish that makes the white gold shine. Perfect for those who love purple and who are looking for a lovely cross pendant to add to their jewelry collection, this prendant is a refreshing take on a plain cross pendant. And be not conformed to this world: but be ye transformed by the renewing of your mind, that ye may prove what is that good, and acceptable, and perfect, will of God. "(Romans 12:2). 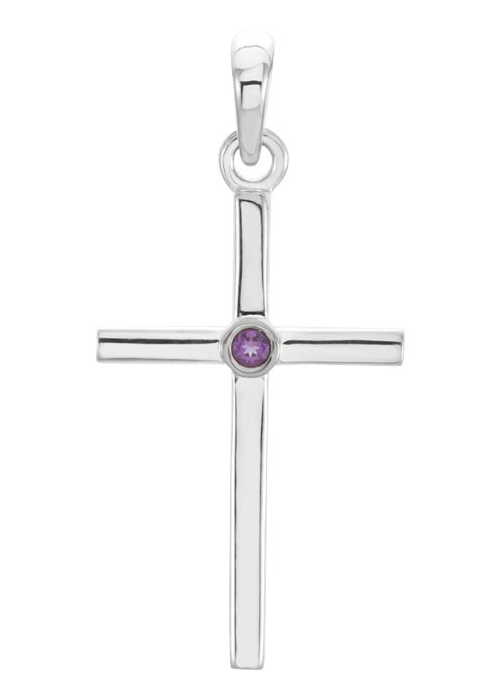 We guarantee our Bezel-Set Amethyst Cross Pendant, 14K White Gold to be high quality, authentic jewelry, as described above.